The above photo says it all. I might pay the rent for my apartment but my place really belongs to the animals. At least three of them sleep with me regularly at night, and sometimes a fourth one joins us. 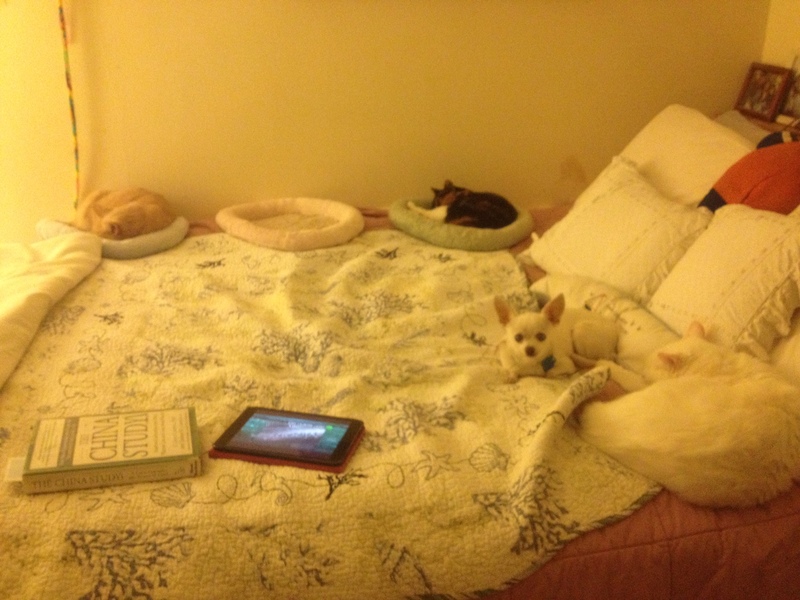 They all have their usual “spots” on the bed too. When I wake in the morning, the first thing I usually do is put the dog down on the floor (she’s blind and teeny tiny so she can’t really jump down on her own), and then my white cat, Max, turns to me for his morning snuggles. It can make it hard to get up some mornings but I do it! Does this mean I will never make space for another human in my bed? No, of course not. They will just need to understand how important my animals are to me and accept that they are staying. If they don’t, we’ll, then they (meaning a guy) won’t understand me, and just won’t be right for me. It’s as simple as that. That is one big white cat! And believe it or not, but Max isn’t even my biggest!! Sebastian is – the one you said was “a bit rotund.” 🙂 And yes, we share that obsession about the beach and ocean!